Intel Wants Touchscreen Ultrabooks, But Will They be Affordable? Intel is showing off a reference design for touchscreen Ultrabooks this week, though PC makers are still struggling to make non-touch Ultrabooks affordable to the masses. It begs the question: If they build it, who can afford to buy it? Engadget spotted the reference design at Intel's CeBIT booth. 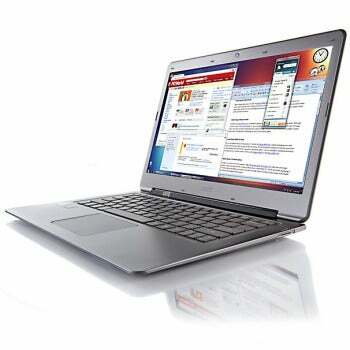 The thin and light laptop, powered by an Intel 1.5 GHz Ivy Bridge processor, had a 13.3-inch capacitive touchscreen with 1600-by-900 resolution, capable of 10-finger input. Intel doesn't sell computers, of course. The reference design serves as a model for other PC makers to use when building their own laptops. But those PC makers are already having trouble keeping prices down on existing Ultrabooks, which run on Sandy Bridge processors--the predecessor to Ivy Bridge--and lack touch screens. Speaking with The Verge, Acer's Christoph Pohlmann said even the current low-end price of Ultrabooks, around $799, is unsustainable. Acer barely profits when someone buys a $799 Ultrabook, Pohlmann said. The low price is essentially a lure for the Ultrabook concept, but it's only worthwhile if some customers buy machines with better specs at higher profit margins. Pohlmann said this model is unlikely to last. As Intel pushes touch screen Ultrabooks with Ivy Bridge processors, I have a feeling laptop makers will be looking forward to a price drop for Sandy Bridge more than the increased power efficiency and capabilities of the new processors. There's just not enough room for PC makers to compete at the high-end with Apple and with each other. Intel also needs to release reference designs for convertible and modular laptops, not just traditional laptops with touchscreens tacked on. If an Ultrabook can turn into a tablet, it stands a better chance of doing well at higher prices, because consumers would be getting two machines in one. With the Windows 8 Consumer Preview available to the public, now's the time to get people exciting by showing what a two-in-one machine would look like.